Starring: Idris Elba, Charlie Hunnam, Rinko Kikuchi, Charlie Day, Burn Gorman, Ron Perlman, Clifton Collins Jr.
“Pacific Rim” is one of those movies where the trailers don’t do it justice, but can still make it pretty obvious whether you want to see it or not. If the idea of Guillermo del Toro (“Hellboy,” “Pan’s Labyrinth”) directing a movie in which enormous robots fight enormous alien sea monsters fills you with glee, run – do not walk – to the movie theater and see this film if you somehow haven’t already. If you think that concept sounds stupid, or dislike big, loud movies, stay away. What the trailers don’t tell you is that there’s actually a halfway decent plot and some very solid character development in “Pacific Rim,” plus hundreds of nods and homages to the many variations on this story we’ve seen before. “Godzilla,” “Neon Genesis Evangelion,” you name it. It’s as if del Toro took all the awesome tropes from his inspirations and left behind most of the terrible ones. For example, the film starts by introducing us to our apparent hero, Raleigh (Charlie Hunnam) and his brother Yancy. Together, they pilot one of the enormous alien-fighting robots, called Jaegers (German for “hunter”) and are skilled at defeating the giant sea monsters (kaiju, Japanese for “strange creature” or “giant monster”). When Yancy is killed, it would be really easy for Raleigh to become completely defined by loss and angst. Instead, his loss shapes him, but doesn’t totally define his character. That’s good, because the real hero of the film, in the literary sense, is young Mako Mori (Rinko Kikuchi). If the whole movie was about Raleigh’s woes we wouldn’t get to watch her hero’s journey from being an untested rookie pilot, through facing and defeating her internal enemies, to becoming the skilled and world-saving pilot we know she can be. It’s easy to miss her arc because the extreme deference she pays to the program’s commander, Marshall Pentecost (Idris Elba), can make her seem weak — especially to an American audience – but it’s there. After all, this is not an American-centric film. The Jaeger force is made up of people from all over the world. Pentacost is English, Raleigh is American, Mori is Japanese, the program is based in Hong Kong for most of the film, and the three other Jaeger teams are Chinese, Russian, and Australian. This is the closest thing I’ve seen to a film really about humanity as a whole banding together in the face of invading aliens, rather than a film about various countries following America (or whatever country made the movie) in fighting the aliens. Enough about the story and demographics! Doubtless what you want to know is, are the special effects good? I am pleased to tell you that yes, yes they are very good. Holy cow are they good. The Jaegers are huge and cool, and all look very different – but importantly, they look weathered and used. These are giant robots that get banged up and then repaired and sent back out, and it shows. The Kaiju look like nothing we’ve ever seen before, strange hybrids of Earth animals and alien physiology that somehow still look real. That realness is courtesy of the fabulous Wayne Barlowe, a writer and painter known to old-school fans of sci-fi and fantasy for his Barlowe’s Guides to extraterrestrials and fantasy monsters. He did the creature and character design for this movie, and it really shows. The final touches that really sell the effects are that the fights are shown in a wide view a lot of the time, so you can see what’s going on, and the enormous figures are given weight by having their movements slowed down. The bigger the creature, the slower it moves, after all. The choreography and cinematography are so incredible that even though the fights look a bit like two enormous tractors smashing into each other in slow motion, they’re still thoroughly exciting. You’ll note that I haven’t talked about the dialog – at times, the script is painfully cheesy. But really, that doesn’t matter. What matters is: are the monsters and robots awesome? Yes. Is there a solid and satisfying heroic arc of development? Yes. 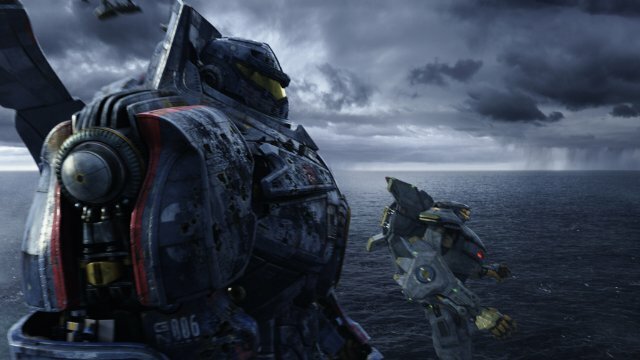 “Pacific Rim” is a masterpiece in the mecha-and-monsters genre, and must not be missed by anyone who even kind of likes that sort of thing.